Production companies, advertising agencies and others can now quickly create web-based sales presentations, casting sessions and digital pre-pro books. Aug. 8, 2011 - PRLog -- Laguna Niguel, Calif.—Simian, a leading provider of web-based media management tools for creative companies in advertising, film, television, music and interactive media , has launched a new feature that allows users to quickly create customized microsites to support their sales, marketing and production activities. Simian is the only media management platform for creative companies that gives users the power to design and deploy customized microsites without the need for third-party plug-ins or knowledge of HTML. The microsite creator is an integrated feature of Simian Projects which boosts inherent functionality and still maintains a streamlined user interface. Building a microsite in Simian is simple. The user selects a template and employs a WYSIWYG editor to create pages and add files from their Projects or Simian Media Library, including video, audio, images, and documents. Microsites can be used to pitch proposals, present concepts and treatments, even replace the labor-intensive pre-pro book used by production companies. They can include detailed information about the production team, clients, talent, vendors, shooting location, script, storyboard, production equipment, supplies and gear and scheduling. Microsites offer many advantages, including the elimination of printing and delivery costs, faster turnaround for presentations, and easy mobile access by anyone involved in the production at any time and from anywhere. Recipients can also post comments and notes on the microsite to share with other members of the team. Additionally, activity on the site can be tracked using Simian Project Analytics. 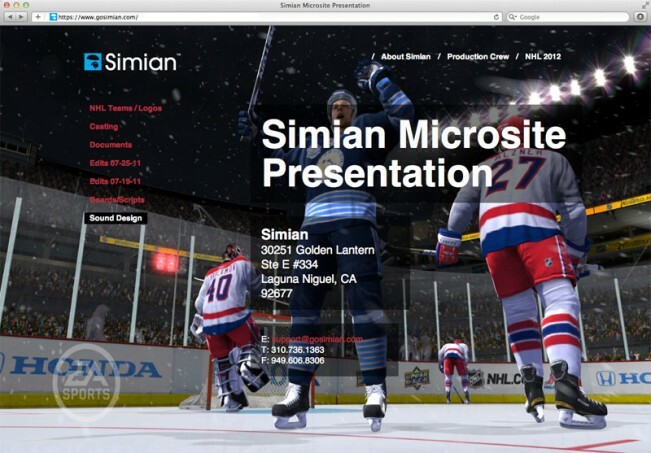 More information on Simian’s Microsite Creator is available on the Simian website. Interested parties can also request a free demo.